The Future Living house took 26 designers to create it. Every technologic leap was analyzed to make sure anything proposed was possible by 2050. It’s a paradigm shift in home resource creation and location. Water uses gravity to generate pressure. 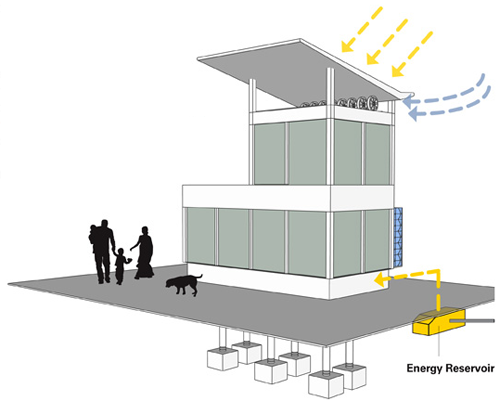 Energy is harvested from solar and wind apparatuses. 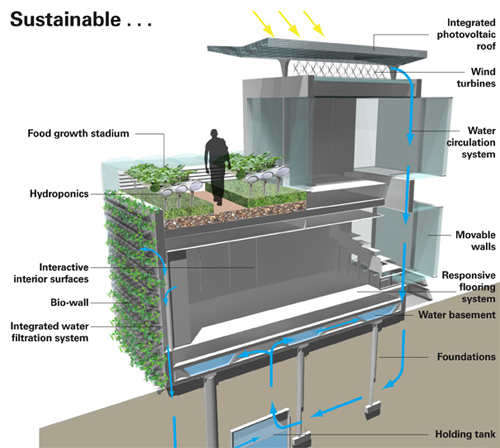 Air, water and waste are cleaned using a living bio wall and everything is recycled when possible. Let’s analyse how water, climate and energy are conceived to make the Future Living house abosolutely eco-friendly. The water attic is an elevated storage tank, allowing water to be fed to various systems in the home using gravity to generate water pressure. Located at or below the foundation level, the Water Basement is the central repository for potable water, kept at a dept geographically appropriate to insulate against climatic changes and fluctuations in temperature. The first stop for the home’s air is the Central Air Care Unit, where large-scale corrections are made to air tha has been humified, cooled or beate from the water in the Water Basement. Right before the corrected air id funneled into a room, the Local Air Care Unit makes room-specific corrections. 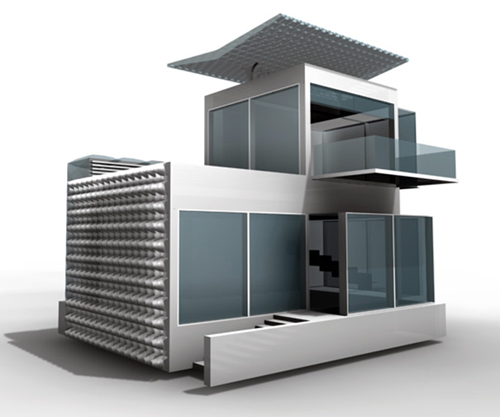 The typical home is outfitted with several univarsal modules for enegy generation: solar, wind and mechanical. The Energy Reservoir stores electricity obtained from the system’s power generation modules or from the supplements provided by a larger community, city, countru or cointained grid. The Design Team includes: Cornelia Bailey, Tanushree Bhat, Marilee Bowles Carey, Anthony Caspary, Eric Diamond, Xiaonan Huang, Reenu John, Na Rae Kim, Paolo Korre, Eugene Limb, Hsin-Cheng Lin, Miguel Angel Martinez, Nikhil Mathew, Elise Metzger, Mahdieh Salimi, Kshitij V. Sawant, Owen Schoppe, Jessica Striebich, Hannah Swart, Traci Thomas, Helen Tong, Sally Wong, Yixiu Wu, HyeKyung Yoo and Gene Young of IIT Institute of Design. Is the forest-based house by architect R. H. Oshatz an example of eco-friendly design? 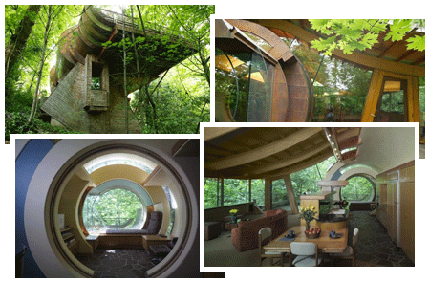 Wilkinson Residence (Portland , Oregon), designed by Robert Harvey Oshatz architect in 1997 and completed in 2004, is a forest-based house. Located on a flag lot, a steep sloping grade provided the opportunity to bring the main level of the house into the tree canopy to evoke the feeling of being in a tree house. A lover of music, the client wanted a house that not only became part of the natural landscape but also addressed the flow of music. One must actually stroll through the house to grasp its complexities and its connection to the exterior. One example is a natural wood ceiling, floating on curved laminated wood beams, passing through a generous glass wall which wraps around the main living room. But is this tree-hourse truly sustainable? Well, looking at these pictures, we realize the design’s characterized by many elements that do not seem really recyclable or with a low impact on the environment; the location is undoubtly eco-friendly but not sure of the materials and production methods used to build such a marvellous house. What do you think about it? Talking about forests and the wood material, it is undeniably true that primary forest is an absolute asset for humanity, an ecosystem that has taken millions of years to give as an enormous flora and fauna biodiversity that, once destroyed, can never be reconstructed again. By penetrating the forest, the wood industry devastates gigantic areas, destroying animal and plant species and the cultural, nutritional and medicinal resources on which the native populations depend. The forest is also in danger due to the fires that prepare the territory for other, just as destructive, activities such as breeding and agriculture that prevent the growth of new trees. The forest is also vital for the rain cycle and to preserve the microclimate: in fact, deforestation contributes to the acceleration of global climatic changes on the Earth and increases the greenhouse effect. This is why it is important to avoid using wood coming from the primary forest and to favour species grown in purposely-created plantations or in European woods in which valid and certified forestry projects are in course. Designed by New York architect Jeffrey McKean, Modesthouse brings architecture home with an elegant balance of tradition and technology. With a refined structural system and generous use of glass, Modesthouse defines space and creates an intimate connection with the surrounding landscape. Modesthouse utilizes a system of pre-manufactured parts such as structural insulated panels (SIPS) for the roof, walls and floor, and FSC certified timber for primary framing to offer an affordable and practical high-end alternative to custom homes. Valcucine recognizes great in value in Modesthouse, as it focuses on environmental consciousness combining sustainable building practices, green energy systems and the choice of materials and finishes, aspects which match with our corporate identity and guidelines. To learn more about Modesthouse and its Systems click here. “Home delivery: fabricating the modern dwelling” (at New york’s moma from July 20 to October 20) takes a look at the past, present and future of the prefabricated house. While the museum’s galleries present a historical account (58 projects carried out over the course of 180 years), outside there will be a chance to look at some possible scenarios in store for the coming years. On a vacant site to the west of the museum, five architects have been invited to build five houses: the cellophane house by Kieran Timberlake in aluminum and SmartWrapTM; Burst*008, the computerised dwelling by Jeremy Edmiston and Douglas Gauthier; the micro compact home by Horden Cherry Lee Architects (eight square metres of ecology and state-of-the-art technology); the Instant House, which uses the precision of laser technology to make fast and economic emergency shelters developed by Lawrence Sass of MIT for New Orleans; and System 3, Oskar Leo Kaufmann’s single dwelling units that can be infinitely combined. The exhibition, curated by Barry Bergdoll and Peter Christensen, describes how the prefabricated dwelling continues to be at the centre of a broader debate concerning sustainability, architectural invention and experimental research into form and new materials. Inside, the most famous Valcucine kitchen: Artematica Vitrum, a glass door kitchen, projected following the ecofriendly project principles: less usage of raw material and energy, recyclability, reduction of toxic emissions, technical durability.